"So popular has Laurie Bagley proved as a cover artist that we are here again with a second of his pictures portraying the 1921/5 Aston Martin G.P. car at speed ... this was produced by the artist from the scale drawings alone, though we have since discovered the existence of a fully restored example of the car ... but too late to help us very much!" 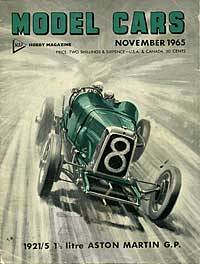 The first page also gives a taster of what will appear in the December issue: a cover illustration showing a Lola 70, plus drawings of the Auto Union Rennlimousin - "a really unusual early streamlined record and racing car", plus further artwork on the '31 Alfa Romeo Monza. Looks like another issue I should try to find! But back to this November issue. The majority of the content errs towards the racing scene, with the first pages devoted to discussion about slot racing layouts, headed by a photo showing Indianapolis racer Parnelli Jones trying out a slot car racing layout at Chicago's ABC TV station. On the opposite page is another well-known former driver, a certain Stirling Moss no less, being beaten on an Airfix slot racing set by a 10 year old lad. BMC Mini Coopers appear to be the competing cars. A number of recent model releases get a mention too, including how to convert the Airfix Rapier into a Lotus Cortina, and the Monogram kit of a Rolls-Royce Henley Convertible, one of the few roadgoing cars that get a mention. The Aston Martin shown on the cover, is the subject in this month's Prototype Parade, a section that presents various plan drawings, and supporting detailed information, on the chosen car. Also of interest to the fan of racing models, is an article on a visit to the workshop of Henri Baigent, a chap who built some superb models by all accounts. Photographs show his 1/12 scale Ferrari 250GT Berlinetta, which looks amazing, with its opening doors, close attention to detail, and even a rotation rolling road on which the model's engine can be demonstrated. The Ferrari model had a registration number of EP 151, and was a commission build. I wonder if it survives in someone's collection now? its hard to imagine a lovely model like this simply being thrown away. A second Prototype Parade details the Maserati 152 'Prototype GT', a car that raced at the previous year's Le Mans and also in the '65 event, following a fatal shunt during a pre-race test day. Converting one model or kit into something different was all the rage back then too (and perhaps still is within model building circles?). The heavily modified model featured in this issue was the Simca Abarth 2 litre, based on a Solido model of the Simca Abarth 1000, modified using plans kindly provided by Abarth Corse of Turin no less. Slot-car racing, whether building tracks or tuning electric motor powered cars to ever greater speeds, gets plenty of coverage in this magazine too, with slot cars of 1/32 scale, produced by companies such as Airfix, VIP, and Revell proving to be among the most popular. SRM offered cars at 1/30 scale, and Playcraft their own range, which were approx 1/36. As a complete break from racing cars, or indeed cars at all, came in the form of an article about a German Half Track (or APC - Armoured Personnel Carrier), again including handy drawings showing the vehicle's layout. The vehicle featured was the Sd KCz 251, as used by Panzer-grenadier units, and by the Pioneer sections of the Panzer divisions. As usual with this type of magazine, there are lots of great adverts to tempt the wallet, eg 1/32 scale Monogram slot cars, AMT kits, Revel Model Car Racing, Scalextric, Humbrol enamel paints, SRM Engineering, Playcraft and Airfix.